eHarmony, Perfect Blend of Matchmaking and Science? On the downside, you have to put everying in their hands. There's no searching and flirting with anonymous strangers here. You’ve probably heard of them from their TV ads or even know someone who’s met their partner there. Either way, eHarmony is one of the best known online relationship sites out there. Their approach is simple: you complete a lengthy questionnaire. Then they match you with others who have similar interests, beliefs and ambitions. You’ll usually receive prospective matches every week, which you can either follow up or ignore. Being a relationship counsellor puts me in the position of meeting and talking to a lot of couples and finding out about their lives and how they’ve met… And often sadly how they’ve grown apart. I regularly see couples that “on paper” should be a perfect match, yet they can hardly stand being in a room with each other. From personal experience my boyfriend and I have been together 2 years, on the outside we have little in common, but we click in ways that are hard to describe – chemistry, spark or whatever you want to call it. eHarmony claims that their formula, which is based on data from thousands of real-life couples, is able to predict which couples are likely to form “successful” relationships and which are, well, let’s say doomed to fail. Now the key is the word, “successful“. Their data is based on relationships which worked out over the long-haul. In other words, successful relationships are those that stood the test of time not those that resulted in lots of sparks and fireworks but little else. Now everyone knows that feeling of having fallen someone who just didn’t seem right for us, the bad rocker boy, the bitchy girl or some other person. Those exiting relationships can be thrilling as well as exciting, but we just know “deep-down” that they are doomed to failure. If you are looking for that type of thing, don’t go to eHarmony. You’ll be sorely disappointed. Who is Suited to eHarmony? All things being equal, if you’re a down to earth sensible type, you’ll most likely be matched with someone who shares your characteristic qualities and life goals. Why? Because those types of couples tend to be successful in the long-term. Most likely that’s why I hear so many people say “they found their matches boring”, or that “they had nothing in common with their matches”. In other words, eHarmony will probably match you with someone your mother would approve of, if you know what I mean. If that doesn’t suit, if you’re looking for something more racy or exciting there are plenty of other sites out there that will cater to you, Match.com or Plenty of Fish come to mind, but there are loads of others. If you’re thinking signing up to eHarmony is a 10 minute job, click a few questions and you’re done you are in for a big surprise. So, if you’ve decied you are looking for that special someone to settle down with, house 2 kids and a labrador, then think eHarmony. So what next? Well the first step to getting on in is completing their personality questionnaire (or test whatever you want to call it). Now if you’re thinking this is a 10 minute job, click a few questions and you’re finished, you’re in for a big surprise. You’ll need to set aside a couple of hours to complete this monster properly (yes 2 hours, this probably isn’t one you can sneakily do in a few minutes at work while your boss isn’t looking). The test is in-depth and examines just about every facet of your personality. eHarmony is also one of the few sites I know of that actually turns people away who they feel are not looking for a serious relationship. Beware: There are questions in the test designed to trip you up and catch out those who are looking for something, well let’s just say more casual. Is it Only for Christians? There’s also a common belief that eHarmony turns away people who are not Christian. Well let me just say I’ve known many people who’ve used the site successfully and who were not Christian. Most also said so on their questionnaire. eHarmony does not normally give a reason as to why someone is rejected, so those turned away most likely just assumed it was because of their religion. I don’t claim to be an expert but I have known enough people using the site that I can draw a few conclusions. What I’ve found in every case is that those who were turned away were not seeking serious relationships, whether they would admit it or not. Well if you’ve got this far you’ve probably been accepted on the site. What now? Well the first thing is, eHarmony is not like a regular dating site where you can just browse around and see who catches your eye and send them a wink. The process is, well let’s just say systematic. 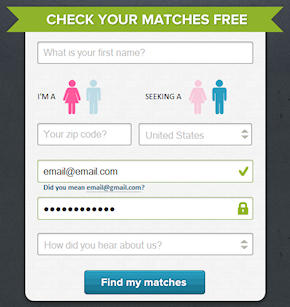 You’ll receive suggested matches every so often, which are based on your questionnaire and any deal-breakers you’ve set. Deal-breakers really just let you tell them you’re not interested in certain types of people. For example, if you only want to meet a green haired, vegetarian non-smoker living within 5 miles of your house, you can put that on your form. When you receive your first matches, you’ll be able to can glance over the profile snapshot of those people, but not everything is revealed at this stage. At this point you have the option to ignore them, or start communicating. This is where the membership plan comes in to play. If you’re on the free plan, basically this is as far as you can go. You cannot contact anyone unless you purchase one of their memberships, which by the way are not cheap. If you’ve upgraded already you can choose to use the site’s guided communication, or just go straight ahead with talking to the person via the onsite messaging. If you choose the guided option, you will basically get to ask the other person a few pre-formed questions. And they can do the same for you. It just lets you get a very general idea of the person and may help you to make up your mind if things are worth pursing further. I do recommend using the guided communication assistance. It let you base your decisions on hard facts rather than emotions. I do recommend using the guided communication assistance. While a bit impersonal, it does let you be clinical and base your decisions on hard facts rather than emotions that can come with lengthy email exchanges. Dating is a numbers game and this lets you find out a little quickly without getting too personal – something that can arise with email exchange. It also avoids the need for having to give them the brush-off. 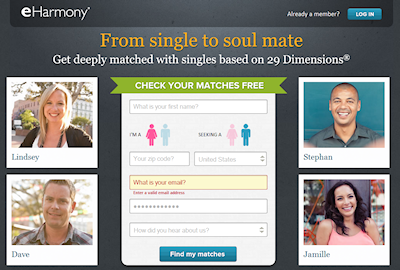 In this respect, eHarmony forces you to be methodical about the whole dating processes. If this seems too boring and clinical for you, then you’ll probably be better off elsewhere. I just hope you’ve realised this before paying the hefty fee. On the subject of cost, eHarmony is certainly not the cheapest service out there, and not only that, you can’t dip your toes in with a 1 month trial like you can on a lot of other sites. At eHarmony you need to commit to a minimum 3 month plan and that can set you back around $120 upwards. One thing to look out for is the free communication weekends which they run every couple of months. Basically access is opened up for a couple days for free members so they can get to talk to people. Given the cost, and investment of time that’s required, eHarmony is best suited to those who are looking for a serious long-term relationship or marriage. Those seeking casual relationships or those unwilling or unable to examine themselves in detail are unlikely to be suited to the eHarmony system. Sugardaddie.com, Looking for Affluent Men? It can work but prepare to wait a while. My worries are gone and I`m fulfilled right now. Erick and I met here and we decided to marry next month. I am really happy after a long time. We are thankful to eHarmony. You made our life. Thank you so much! I honestly can’t say enough about this site! I guess you can count me among the “lucky” ones that has found happiness through eHarmony. I was really impressed by the depth that you have to go into when completing your profile- the test took me a few hours, but it actually taught me a lot about myself because I was forced to be really honest in order to get my “best” matches. The guided communication was a little awkward for me, however, as i’m not usually that blunt in my conversations with people. I can see the point of it, however- it really keeps you from investing your time in people who wouldn’t be right for you in the end. As for the cost aspect, yes, it is quite expensive! I like to think of it this way though: if you’re really serious about finding someone to spend your life with then it’s pennies in exchange for your happiness! I didn’t even get all of the way through my 3 month membership before I started to date someone who eventually became my “one”- we’ll be married for a year this coming September. I was very happy with my eHarmony experience, and I am always quick to recommend it to friends that are really looking for love. I was never under the impression that eHarmony was just for devote Christians although religion does play a role in match making. With this said, perhaps some people get rejected because their religion is just not prevalent on the website, or maybe their personality does not fit the mass that eHarmony caters too? I am just making educated guesses, and am surprised to hear that there are rejections within the system. I, a long time ago, signed up for eHarmony and must that the process was quite lengthy and did indeed take me several hours to complete the personality questions. I never kept with eHarmony as it was just something that I had signed up for in my spare time but never really thought about after a few weeks of being on it. I think that the system that they use in order to match people is not all that unique but rather built really well in an in-depth system that no other site has really put the time into. eHarmony has utilized an analysis of personal character – like personality, dreams, wishes, morals, etc. This is not something new, but rather is the only site that has bothered to actually put forth a great deal of effort in providing the perfect match based solely on compatibility of personalities. Now, this does not mean that the match will work out, but it does mean that there is a major increase in the chance of the match being compatible with one another. I do believe that there are many people out there who could be your match, but it really depends on what you are looking for at that point in your life. If you are looking for that person who wants to settle down, have kids, own a house, and own a dog then of course eHarmony is going to work for you if you put the time into it as that is what eHarmony boasts; serious relationships. From what I have seen and experienced in the field of dating websites, eHarmony seems to be the website that has the most “maturity,” is what I will call it. The site takes into account every aspect of your personality and goals and provides you with those who are like minded. Not everyone will be matched with like minded people, but the majority of the masses will be and that’s why eHarmony works. The only downside would be the fact that you are not in control of any of the process, and you don’t get to really select your matches… they are delivered to you and you can then choose from there on whether you want to communicate with them. Perhaps taking the choice out of the equation does provide a better chance of success because eHarmony does the decision making for you and you do not get stuck making a wrong choice in terms of compatibility. Overall, I think eHarmony would be the first site I would recommend to someone who is looking for a serious relationship as it is probably the best site out there for plausible success. MillionaireMatch, Want to Meet A Millionaire? PlentyofFish, It’s Free But Does it Still Work? Copyright © 2019 Review Sites, All Rights Reserved.